(CNN) -- New Sunderland owner Ellis Short insists that he will not interfere on the football side following his takeover of the English Premier League club. 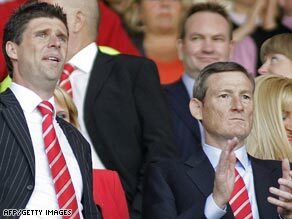 Sunderland chairman Niall Quinn, left, and new owner Ellis Short at the club's final game of the season. The American billionaire will buy out the controlling interest of the Drumaville Consortium headed by club chairman Niall Quinn, upping his stake from 30% to 100%. Based in Texas, he has made the North-East club the fourth in the Premier League to have American owners, alongside Aston Villa, Manchester United and Liverpool. His move came hot on the heels of news on Wednesday that Portsmouth owner Alexandre Gaydamak had agreed to sell his club to United Arab Emirates businessman Dr Sulaiman Al Fahim -- who was previously instrumental in the Abu Dhabi United Group's takeover of Manchester City. Short, who saw Sunderland avoid relegation on the final day of the season last weekend, told the club's Web site that he will be sticking to the financial side of the business and allowing former Black Cats striker Quinn to deal with football operations. "Niall runs the club," the 48-year-old said. "Niall is a very smart footballer, very smart about the Premier League and is a wonderful chairman of the club who knows more about football than I ever will, so I will be in the background and Niall will be running the show. "I will be involved in things like finance. With me coming in, you get all of these other good ingredients that are already in place at the club and can add to that a streamlined decision making process, a streamlined board and with some financial ability to make some moves -- and we think that is the missing piece that this club has needed." Short funded Sunderland's transfer business last summer, with former manager Roy Keane spending large before surprisingly quitting in December after a poor run of results. His replacement Ricky Sbragia stood down last weekend after guiding the team to safety, and Sunderland have now been linked with a move for Wigan boss Steve Bruce. Short said he was prepared to further invest money in new players for next season. "It's a very big club with a lot of fans, a big stadium and a lot of revenue -- and when you are in a position where we are, trying to improve it, it takes money," he said. "But if that money is invested wisely, and the personnel decisions that you make are good ones, then I'm not worried at all. I fully expect that Niall will be able to make good personnel decisions going forward." Sunderland announced on Thursday that veteran Dwight Yorke was one of seven players to be released ahead of next season. The 37-year-old Trinidad and Tobago international, who is out of contract, will depart the Stadium of Light along with striker David Connolly, midfielder Arnau Riera, goalkeepers Darren Ward and Nick Colgan and young defenders Peter Hartley and Niall McArdle. Meanwhile, prospective Portsmouth owner Al Fahim has told fans he intends to build a "great football club" once his takeover is completed. Pompey have accepted an offer from the Arab property magnate, and a period of due diligence will take place in the next few weeks. "Everything I have seen makes me sure that we can build a great football club in the years to come," he told arabianbusiness.com. "Portsmouth has incredible history, and its fans are some of the most loyal in the world of football. I look forward not just to working with them, but listening to their views on how they want to take the club forward. "I am the investor, but this is their club and their community -- and it is a privilege to be taking charge."